This week, I started laying the groundwork for an organic vegetable garden. I’ve been digging out some grass for the beds (6-8 inches below soil level in some spots to put in a good, deep path) and sheet mulching other areas right on top of the grass. I’ll post a video tomorrow to show where I’m at. But this is not going to be the usual rectangular garden with straight rows that sits in the back corner of many yards. Not that there’s anything wrong with that, but I’m going for more of an attractive, curvy, densely-planted organic vegetable garden that blends into the landscape and comes right up to the patio, just steps from the kitchen door. That way, fresh herbs and veggies are just seconds away from the chef. But one thing that is going to make it slightly less beautiful is the 2 foot tall fence around the curvy edge of my garden that I’ve started erecting to keep out the rabbits, who like vegetables just as much as me. I used slender bamboo for the poles and chicken wire for the sides, so it’s not all that intrusive, but not the most beautiful thing ever. So I was sitting here cursing these rabbits when I started to think of some of the benefits we get from animals in our organic gardens. I thought I’d pass some of these benefits on to you as something to remember the next time you’re dealing with aphids on your greens or grubs in your lawn or deer into, well, everything. 1. Let’s start with manure. After laying the newspaper right on top of the grass for my sheet mulch, next went a couple of inches of horse manure, loaded with worms. Manure is organic matter and fertilizer for the soil. It often contains seeds transported from somewhere else that will germinate and grow into plants – that’s good for nature, but inspires me to either compost it first or put it at the bottom of my sheet mulch. This composting process and the sheet mulch I’m setting up in the organic vegetable garden also help deal with most pathogens, and sometimes high concentrations of nitrogen, potassium and salt. There will also be some beneficial microbes in there to help the process along. 2. While the rabbits like to eat my vegetables, many of those same vegetables are actually pollinated by other animals, especially birds, bees and butterflies. I’m very happy to have them buzzing around these days because I know they make the garden tick (this is in spite of the fact that when I was a kid, I was stung by a few wasps all at once when I jumped onto a bed where they were lounging, and since then, I’m slightly anxious around anything with a stinger). Colony collapse disorder, which refers to the mass death of honeybees that has been alarmingly high for the last 5 years, is troubling not just because we’ll have less honey, but because we’re losing one of our main food pollinators. 3. Insects (such as mites) and microscopic animals (such as nematodes) are largely responsible for making minerals available to plants as a result of eating microbes. What happens is that the microbes – mainly bacteria and fungi – break down organic matter and fix nitrogen from the air and get other minerals from rocks and so on. 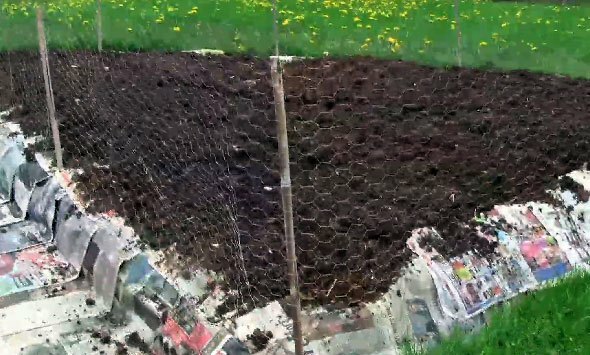 They are constantly working in the soil and like I said last week, they “immobilize” nutrients by storing them in their bodies, and then animals (and other organisms) “mineralize” these nutrients when they eat the microbes, which means those nutrients are made available again. This process allows us to reap the rewards from our organic vegetable gardening. These are just the first 3 points that came to my mind, but there are more and I have to get back to my sheet mulching. I would like to get a better list going, though, so if you think of something, feel free to let me know below. You mentioned earthworms, but not how incredible they are at tilling the soil. I haven’t rototilled in years because of them! Oh I agree! I have a stand alone composter and I turn it a lot, but the bottom stays getting turned by the earthworms, and when I dig that out of the little door it is so soft and crumbly! If anyone has one of these -make sure you dig right down, as the goodness goes down quite a few feet! At the garden where I work we spend our time destroying butterflies and caterpillars, because of the distruction they do. It’s not a good feeling, but my boss says it is a necessity. Is there more to it than that? Butterflies aren’t plant pests. Caterpillars can be, but if you grow healthy plants, they’ll go away. So far I have had been able to keep wildlife, including rabbit, squirrel, deer, etc.. out of and away from my garden by interplanting zinnia, vinca, snapdragons, lavender, mint, rosemary, and salvia.. I will give lettuce for instance a border of one or two plants, around each raised bed, I will plant several different plants to keep them away. I live on 20 acres that is not cleared off as of yet and we have wildlife all around, my garden is out in the open with no fence around it. I do however, throw out extra seeds that sometimes germinate on there own, or I try to make sure there is some source of food available to them throughout the property year round. The only thing I can not seem to get a handle on is grasshoppers and crickets.